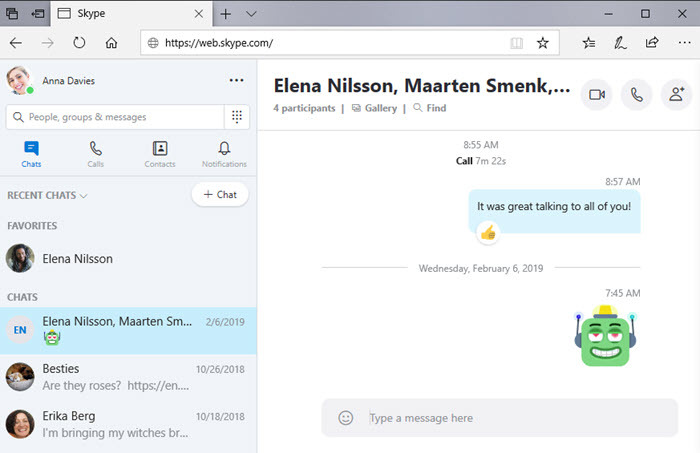 Skype for Web is the easiest way to enjoy Skype’s features that you're familiar with in the desktop app, without having to download it. 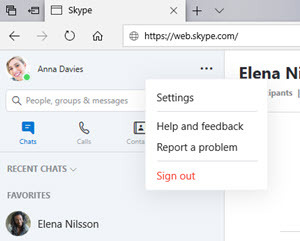 You can sign into Skype for Web on Skype.com and start chatting right away. You’ll need to use Microsoft Edge or the latest versions of Chrome. Learn more about Skype system requirements. What can I do with Skype for Web? Update your status to Active, Away, Do not disturb or Invisible. Add Skype credit or a subscription from Skype to Phone. Access our download page from Get Skype app. People, groups & messages - Search for your friends, groups or a conversation quickly. Dialpad - Access the dialpad to make a call. Chats - View your recents chats, favorites, and start a new conversation. Calls - Find your recent calls or make a new call to one of your contacts. 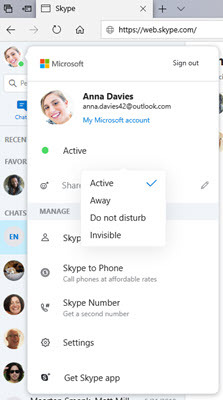 Contacts - Go to your contacts where you can add a new contact, see your Favorites and easily filter your Skype contacts to show who is Active Now on Skype. Notifications - View your Skype notifications. Chat filter - Sort your chats by Time or Unread or Hide favorites. Chat - Start a new group chat, a new one-to-one chat, or a new Private Conversation. Chat name header - Quickly get to your contact's or group's profile and settings. Gallery - Find your photos, web links and files shared in the chat. Find - Search for specific text within the chat. How do I find new contacts in Skype?